The following tips will help you make the best of the unforgettable experience of hiking the Inca Trail to Machu Picchu, some 2,380 meters above sea level. This hike takes approximately four days and is considered to be moderately difficult. The best time for this hike is the dry season, from May until the end of October. The peak tourist season in the Andes. There are fewer tourists during the rainy season, from November up until April. In February the trail is closed since it is very wet and cold due to the constant rains. Some parts of the trek become very slippery making the hike dangerous. A tour operator will provide tourists with all the necessary equipment, such as proper camping and cooking equipment, food, transport, first aid kits as well a cook, porters and professional guides if so desired. Once you arrive to the ruins you will have to check your backpack in the storage room, this is to avoid accidents. At Machu Picchu, there are places to stay- previous reservation-, such as the Sanctuary Lodge and Machu Picchu Pueblo as well as various hostels in the nearby town Aguas Calientes. A more direct Inca Trail to Machu Picchu has recently been discovered. 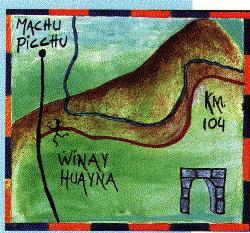 This route, known as the Royal Inca Trail, which can now be used by tourists, starts at Km 104 of the railway. very close to the archeological ruins of Chachabamba, where the Incas worshipped many Andean deities. By walking the Royal Trail you can reach the citadel of Machu Picchu in one or two days. You will pass by the ruins of Choque Suy Suy, Wiñay Wayna ("Always Young") -where you can spend the night- Inti Pata ("Place of the Sun"), Huayractambo ("Resting Post of the Winds"), and Inti Punku ("Sun's Gate"). Inti Punku, the entrance gate to the great citadel of Machu Picchu, is the highest point on the Royal Inca Trail at 2,700 meters above sea level. On the traditional Inca Trail, Warmiwañusca Pass at 2,640 meters above sea level is the highest point. Watching your Health: Getting accustomed to the high altitudes is essential, it usually takes about 3 days. When travelling to Cusco and the Inca Trail, you must get used to the attitude to prevent problems such as soroche, altitude sickness. Soroche does not only make you feel sick but it can have more disagreeable consequences such as headaches or lung problems. On the first day at these high altitudes, you should take as much rest as possible. Eat very little and drink plenty of liquids. Mate de coca tea is especially recommended as it is renowned to have great digestive and healing properties. While doing the Inca Trail, you are advised to drink only boiled or bottled water and at night, tea or mate de coca. You should never drink water from the springs as it could well be contaminated. It is common for cattle of the area to be carriers of o certain virus, that produces an intestinal disease known as Giardea. The Inca Trail is basically a safe route, although there are some stretches with some rather precarious precipices. If you want to properly take in the scenery, you are advised to stop, so as to avoid any distractions that might lead to accidents. You really should not ever leave the trail as it very easy to get lost or disorientated. Please remember never to litter or pollute this natural habitat, the "Historical Sanctuary of Machu Picchu", and do not damage or deface any of the archaeological sites along this route. Camping among or near the ruins is not allowed, and to be careful when you lare around a fire. Forest fires are a definite liability in the area. Always bear this phrase in mind: "Take nothing but the images captured by your camera. Leave nothing but your footprints." If we all respect these principles, it will really help preserve the Inca Trail, considered by UNESCO as "a Heritage of Mankind", for future generations. You should bring at least two changes of mountain clothing, as well as a pair of shorts and a couple of short-sleeve T-shirts. Taking two pairs of sports shoes or trekking boots can also be a great help. You should take a knitted cap (chullo), a scarf, some socks, a pair of gloves, a sweater, or thick jacket and some waterproofs for the nights. You will also need a sleeping bag, a mat and o small knapsack for your personal belongings as well as a big duffle bag or a rucksack to carry all of this. We also strongly recommend you to take with you a pair of UVA sunglasses, some sun block (15 spf minimum), mosquito repellent, a flashlight (extra batteries and light bulb) a first aid kit, water canteen, a bathing suit and a towel. MachuPicchu is a protected area. Hikers are allowed in guided groups. An extra night at a selected hotel in Machu Pichu or Aguas Calientes can be booked in advance.